honey, cheese, 2    cups of tea or coffee and a cup of milk, bread. during    sailing it is very difficult to prepare, cook and serve. a) There is a bar on boat, you can buy &drink cold or hot drinks. The crew  will serve to you. b) You can bring your drinks to boat. EXTRA 30$ each/week . The crew will serve to you. The sailing wooden boat Flying Carpet was designed by URRU brothers on 1926.
using oak and chestnot lumber . She is capable of cruising under full sails. Each cabin has private shower and WC. 4 double cabains for up to 8+2 kids. ( There are two beds for kids in 2 cabins.) 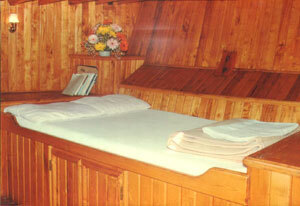 3 cabins have french bed, one has 2 singles. Every cabins have 2 pillovs, pilocases, 1 blanket, sheets, toilet paper and a soap on WC. She has a dingy with outboard for emergency cases. A generator on board. %30  will be paid on reservation. Rest of bill will be paid on the begining of cruise.